Last year we wrote an article that outlined the top 8 sales you should be running for the holiday season. We didn't know it at the time, but it would turn out to be the most read article we've ever written! 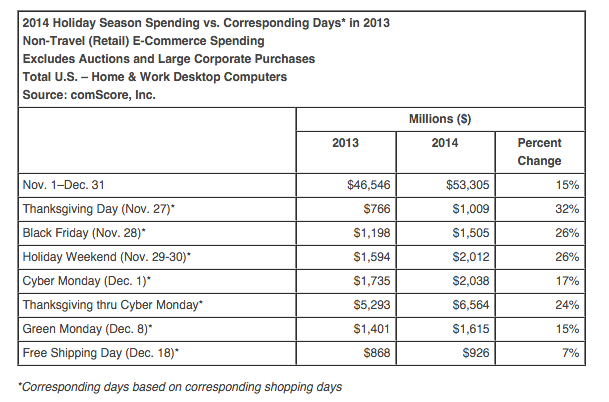 Holidays are the #1 time to capitalize on shoppers. In fact, the next couple months can make or break the bottom line for a lot of stores. Every single holiday day went up from 2013 to 2015, and projections are already saying the online holiday sales will increase EVEN MORE this year! Because you loved it so much, we decided to re-visit the topic this year, go over some of those tried and true favorites, add some more details, and some new kinds of sales to try. These sales will help you get your store prepped and ready before the major traffic hits and you're in the thick of things. By putting these to work, you'll be setting yourself up for your best holiday season ever! This is one of the sales I'm the most excited about since subscriptions are the biggest thing to hit eCommerce this year! If you offer any kind of subscription service in your store, you know how awesome it is to have revenue coming in every month. Wouldn't it be even better if your subscribers could get their friends in on the fun? 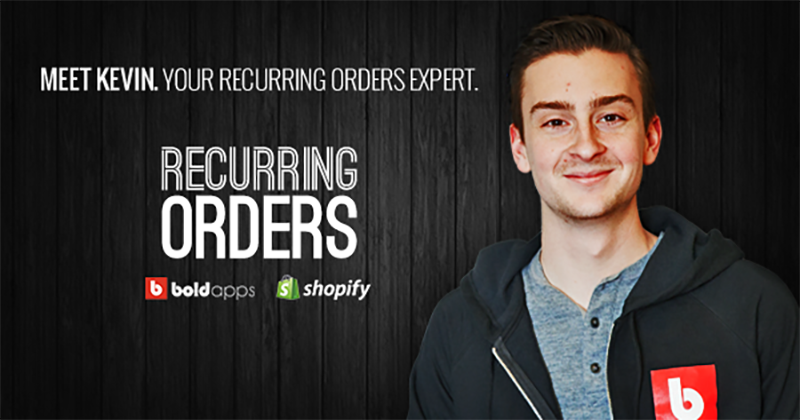 We're releasing an update to our popular Recurring Orders app shortly that will let you do just that! You'll be able to create an option to let your customers buy a pre-paid amount of time for your subscription. For example, someone could come in and buy their friend 3 months of your coffee of the month. Then when those 3 months are up, that friend could decide to keep their subscription and become one of your customers too. It's one of the best ways to get new customers, and this will all be ready before the holiday rush hits. How to - Our Recurring Orders app is about the get a big update that will let you do this in a snap! All you'll need to do is check off a box allowing gifting, and pick what kind of prepaid offers you want to allow. That's it, you're all set to start giving the gift of subscriptions. This a twist on a classic. You've probably heard of a Buy One Get One (BOGO) sale before. There's a good chance you've bought something because of one of these sales before too, so you know they work. What if instead of only offering a discount on a second of the same item, you gave people a choice of gifts for adding more than a certain amount to their cart? Make your gifts good enough, and you'll have people buying more than they were originally planning more often than you think! With this sale, every time someone adds enough to their cart, they'll get that option to choose one of the gifts you've selected. Nice and simple, but with tons of potential. How to - Running this sale is easy! All you do is create the discounted or free item with the Product Discount app and use its “Duplicate and Hide” feature to make the product invisible on your store. Then head over to the Product Upsell app and create an offer that gets triggered at the appropriate amount that includes the discounted or free items. 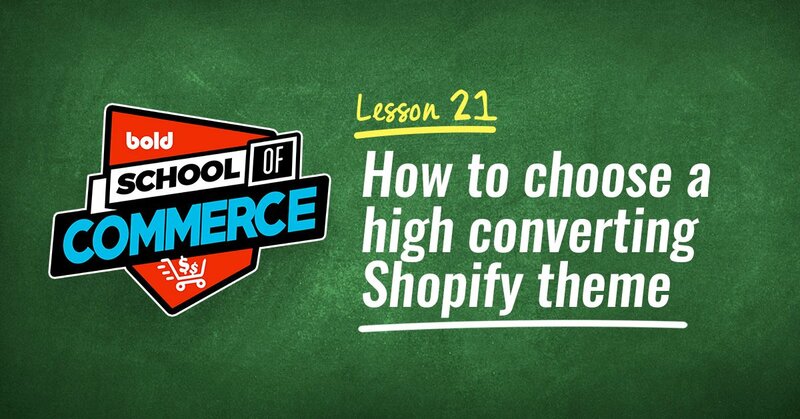 Your customers want to buy more from you, you just need to give them the right incentive! One great way that we've seen people use before is to offer discounts based on how many items the customer is buying. The more they buy, the better price they get. Buy two and get 20%, buy three and get 30%, and so on. The percentages can change, but you get the general idea, you want to convince them to buy a few extras. This gives people a reason to want to buy a few more than they may have planned to buy. Or let's them squeeze in a few extra gifts for people since they're getting such a good price! How to - This is another easy one to set up. All you'll need is our Quantity Breaks app, and about 4 clicks once you have it installed. All you're doing is picking the products to offer the discounts on, how much you want to give for each set of quantities, and put it all live! Head over to the app page, give it a download, take a quick look at the video, and you'll be all set up in no time. There's nothing better than a clock ticking down to convince someone to complete their purchase. 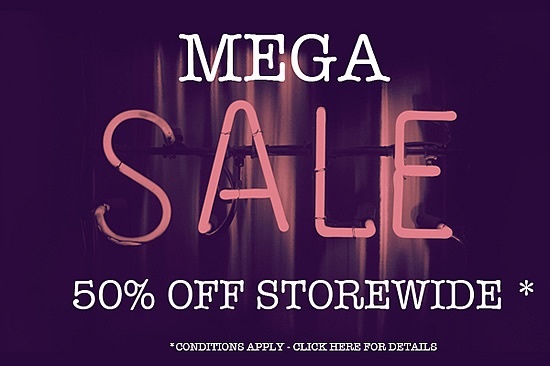 This is exactly what you can do with this sale type! You drive traffic to your site at slower times by offering different discount percentages during different time periods. For example, at midnight, everything is 50% off. At 1am it changes to 40%, 2am is 30% and so on. It will get people visiting at specific times to get the best deals, and give them a time limit to make their purchases before they miss out on the sale! How to - All you need for this sale is our Product Discount app, and then create each sale that starts and ends at the appropriate times. *NOTE Just keep in mind, if you're putting a lot of products on sale to make the stop time shortly before the actual cut-off. This will give the app enough time to change all the prices to what they should be. 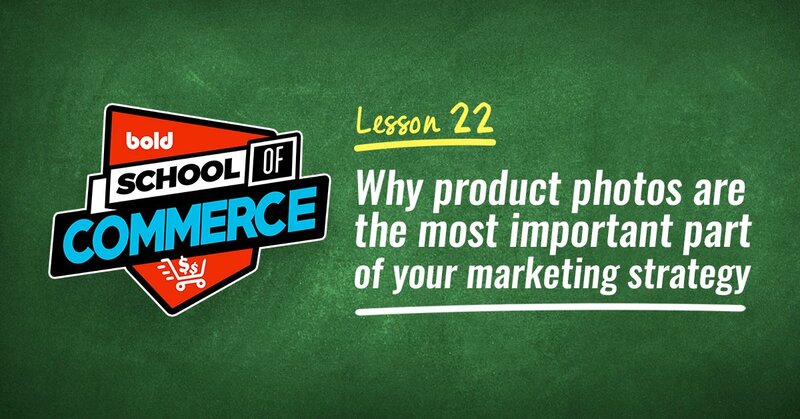 Sometimes the best promotions aren't sales at all, but ways to add value for your customers. During the holiday season, the number one addon you can offer is gift wrapping! You can go at this one of two ways. One way is to offer this as a small upsell to make a little more profit on every sale. This is great if you have other sales and promotions that are converting the sales. Option two is to offer it as a free service to make the decision to purchase that little bit easier. This can be a great offer to close the sale and get people checking out. How to - Staying with the theme, this is also extremely easy to set up. By installing Product Options, and just a few clicks, you'll be able to add this option to all, or a selection of products in your store! While you're at it, maybe there's some other options you want to add to your products too, or maybe you'll want to take advantage of the adjustable pricing and logic that is included. Did you know that when people can see how far they are away from something free, they're much more likely to buy the last few things to put them over the requirement. Grocery stores, Amazon, and all sorts of other companies are great at doing this, and you can be too! Want to offer free shipping, or a free gift when someone adds over $100 to their cart? With the Motivator app, it's super easy. You'll be adding a small bar to the top of your site that drops down every time they add something to their cart telling them how much more they have to go before getting their free bonus. How to - All you'll need to do is set up a promotion with your Motivator app. Choose the amount you want them to spend, and what you want to give them, and then you're all set! The app will take care of the rest, and start reminding people that they're almost there right away. If you have products that compliment or go with each other, a bundle sale is exactly what you need! Bundle sales are a win-win, the customer gets to give a bigger gift and you get larger checkout sizes. With the Product Bundles app you can set this up in a few minutes! Bundle sales are similar to a Quantity Break sale (buy two get 30% off, buy three get 40% off) except the main difference is a bundle needs to have certain required items in it. The required items can be individual products, or products that are in certain collections. So even though you may not have time to create bundles for individual products for the holidays, you can create collection bundles (example 2) with just a few clicks! I know you've seen this one before. Walk through the mall, listen to the radio, or watch for flyers coming to your house around the holidays, and you'll see it again this year too. This one is a lot like the going, going, gone sale from before, except instead of different prices for different times, you're going to put different products on sale. Let's say you're selling clothing, you could have all your men's shirts on sale from 12AM to 6AM, women's shirts from 6AM to 12PM, mens pants from 12PM to 6PM and so on. Change it up with larger and smaller time windows, or offer more than one category per time group. No matter how you do it, it's a great way to bring people back to your store at all sorts of different times. Who knows, maybe one time that they come back, they'll see something they weren't originally shopping for, and buy that too! How to - This one is a piece of cake, and a lot like the previous timed sales. You'll set it up in the same way, except instead of doing store wide discounts, you'll choose specific categories to discount during different times. Get creative, and see what works for your customers. The whole point is to get them checking back often! Tried and true, this one will never get old, and never fails to get your customer to take that last step, and make their purchase. 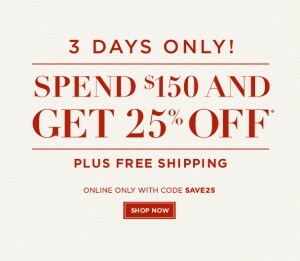 Put your whole store on sale with the click of a button, and watch people take advantage of the holiday sale to add a little more to their cart and finish shopping for everyone on their lists. 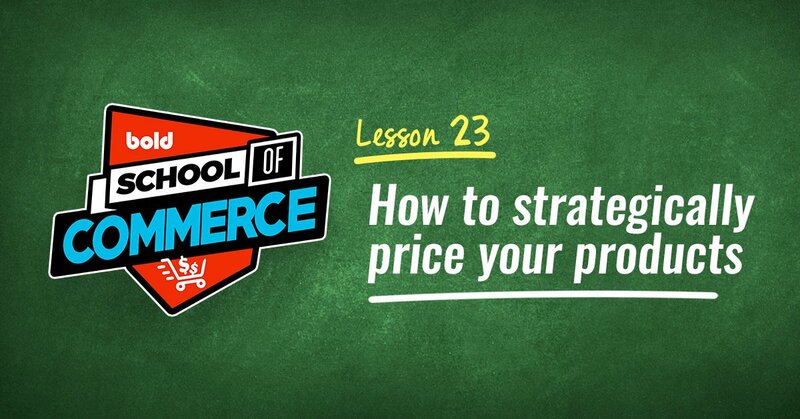 How much to put everything on sale is completely up to you, but the better of a deal you can afford, the bigger incentive you'll be giving your customers to buy from you. You also have a few special things you can do with this, like only putting certain categories on sale, or running the sale for only the last few weeks (or maybe even the first few). 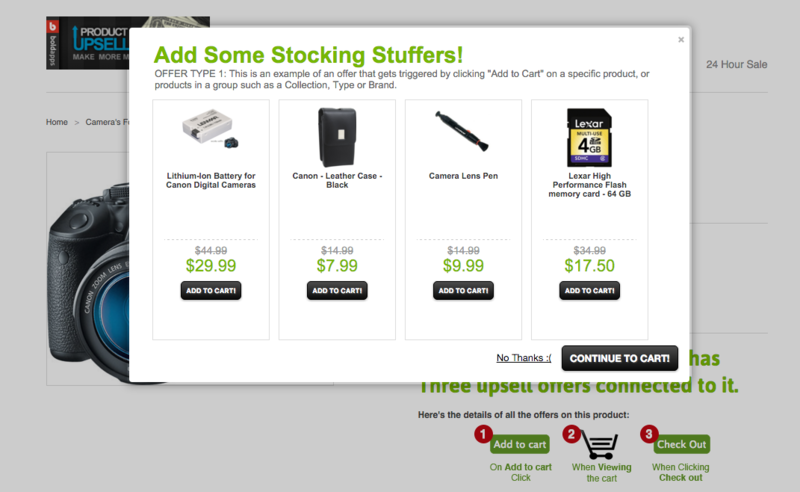 See what you can do with the app to entice people to check out all your awesome deals. How to - This one is only a couple of clicks with Product Discount. Nice and easy. We've all been there before. We have a list of things we're planning on getting people (or ourselves) but we just can't think of the last couple items to finish off the list. Don't let this opportunity to help your customers out pass you by! You have great products, and they're already planning on buying something from you, why don't you start making some offers for other items that would be great along with their purchase? If you know people who buy your tshirts usually love your posters too, start suggesting them to people who are checking out with just a tshirt in their cart. You can even offer the posters at a better price since they're already buying something from you. You can do this with all your products, think of great items that go well with them, and start offering them! 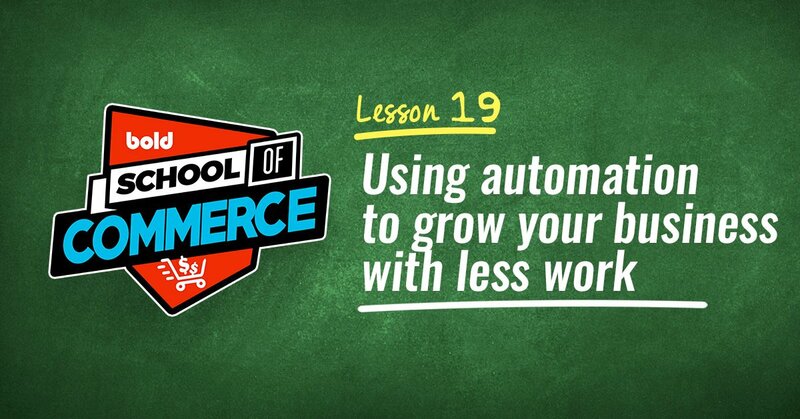 How to - Product Upsell lets you do exactly this. You can choose when the offer is made - when they add it to their cart, when they go to their cart, or even right before they checkout. You can also choose how to trigger the offers. By total amount in their carts, certain products being added, or a combination of the two. You'll have plenty of ways to put great offers in front of customers who are looking for those last couple things to finish off their shopping. Last but definitely not least, let's not forget about in store sales and promotions to go along with all the cool stuff you're already doing online. Everything we've been talking about so far can also be taken to your store, but some of it can be a little harder than others. The good news is that if you're using a Shopify POS system, you'll be able to do quite a few of them a lot easier! Our Ultimate Sales Manager app can help you set up all kinds of sales that will automatically come off when your customers check out. You can run Buy One Get One (BOGO) sales, timed sales, spend this get that, and spend this save that sales, all within the app. 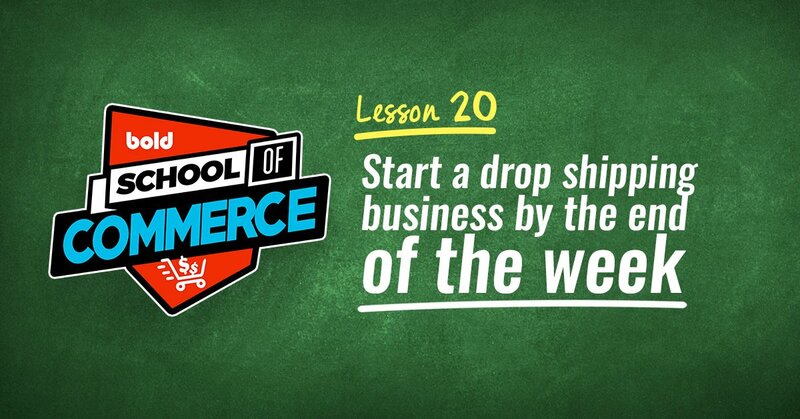 All it takes is a little quick setup, and you'll be off and running, offering sales online, and in store. This will let you take care of your customers no matter where they shop, and make the most out of all the traffic you're getting! Check out these AMAZING Black Friday Sales!